Five Ways to Serve up New Information in Chewable Chunks! Do we learn better when we receive small chunks of information over time? Or when we’re introduced to a large amount of information all at once? That’s an important question to consider before embarking on a training program for your service or technical support team. However, before giving your answer, let’s talk about the process of learning. What Is Learning and How Do We Learn? Learning is the process of taking in new information so that it can be accessed at a future date and put to use in your everyday life. To do this your brain must 1) receive information and process it in your ‘working memory’ and 2) integrate that information into your ‘long-term memory’. Here’s the rub. Working memory—which sorts, files, and makes sense of new information—has a limited capacity, sometimes called the cognitive load. When the brain is given too much information to process, the working memory can’t handle it all, and the extraneous material just falls away; it never gets processed or stored in long-term memory. The theory that working memory has a limited capacity was put forth in 1956 by George A. Miller, one of the founders of the field of the cognitive psychology. Miller believed that working memory could hold no more than seven (plus or minus two) pieces of information at once (later research has shown that the exact number depends on the type and quality of the information, as well as the skills and abilities of the learner). Miller subsequently introduced the concept of learning in chunks. Trainers have an opportunity to structure content in a way that actually reflects how our brains process information. When training is delivered in small chunks—known as ‘chunking’—it can be more easily managed. Additionally, when chunks build upon each other and upon existing knowledge—either through repetition or related topics—learning becomes more efficient, and information is more readily grasped by the long-term memory. Think of your brain as a giant file cabinet. As you take in new information, you want to be sure it goes into the appropriate folder, otherwise it gets lost in the mess on your desk! In this respect, chunking is similar to filing. When you file one piece of information at a time, the brain stays focused and files the information correctly. When you file several bits of information in the same file folder the process is quicker than searching for a new folder each time. This saves time and makes retrieval of the information much simpler. Training can take place in a number of forms—e-learning, web-based seminars, self-instruction manuals, classroom-style presentations, etc. No matter the format, here are five recommendations for designing more effective training. Organize information into small chunks or segments. Look for connections and relationships among ideas, such as categories, similarities/differences, cause/effect, etc. Keep the content focused, as extraneous detail can overload the working memory and distract the learning process. Build upon the learner’s existing knowledge base and prior experience. Learning takes place more quickly when new information can fit into the context of current understanding. Students must connect new knowledge to previous knowledge in order to learn. Consider attention span. Some researchers suggest 45 minutes is the maximum. Others say 60 to 90 minutes. Others suggest 20 minutes. This, of course, varies with the audience and delivery method. Make connections to real life. When you include real world problem-solving exercises, case studies, role play or hands-on experiences, the learner gets to pull information from long-term memory and apply it to the workplace. This is a very effective way to practice and reinforce concepts. Know your audience. 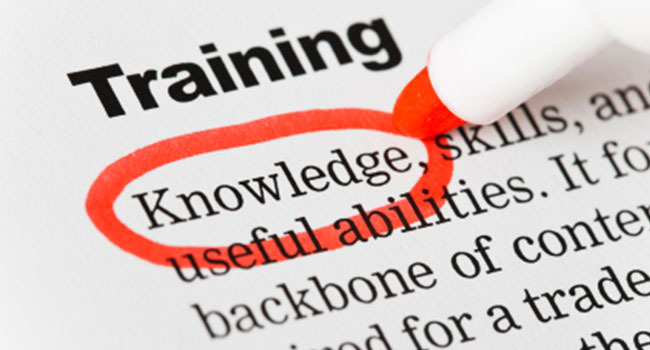 The purpose of training goes beyond just delivering information. You want the learner be successful. Identify what the learner knows and doesn’t know and build upon it. Understand your demographics, as this can help determine their attention span and preferred method of learning. Over time, memory and enthusiasm fade and old habits return. No matter how well training is structured, reinforcement becomes key to retention. By some estimates, three-quarters of training will be lost without it. What to do? Continue to think ‘chunks’. Wherever possible, integrate learning into the normal workflow. Provide regular reviews via email, video, or follow-up gatherings to help reinforce what has been learned. Utilize praise and constructive correction, and lead by example. Quality follow-up by management will go a long way to help a well designed training program stay in long-term memory!